With the growing popularity of foot fitness and barefoot training within the health & fitness industry, professionals are beginning to appreciate the impact that improper foot function can have on lower extremity alignment and total body function. To truly understand the connection between feet and function, an understanding of the different foot types and foot imbalances is imperative. In all EBFA courses and Certification workshops we educate professionals on the basics to performing both open-chain and closed-chain foot assessments. The goal of these assessment techniques is to build an appreciation for the unique differences each person can have in foot mobility, structure and function. To date, most of my EBFA Blog posts have been about the pes planus or flat foot. But the impact that a caves or high arched foot type can have on alignment and functional movement is just as important to understand. When we look at a true cavus or high arched foot there are some characteristic joint alignment issues that should begin to jump out at you. As we look at the cavus foot from behind, it is quite apparent that the heel is turned in or inverted. This STJ position causes the navicular bone to sit in a position that is superior to that of the cuboid – causing the mid foot to excessively lock. Remember that it the unlocking of the mid foot that allows our foot to loading impact forces and use them for potential energy and efficient movement. 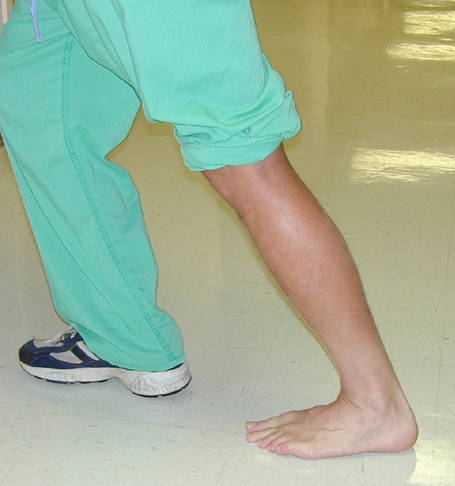 This increased STJ inversion can be the result of an imbalance between the muscles on the inside of the ankle (posterior tibialis and anterior tibialis) and the muscles on the outside of the ankle (peroneals) – or it could be a compensation for a plantar flexed 1st ray in the forefoot (more on this soon). As we look at the foot from the side what gives this increased appearance of the high arch is what called the “pitch” or inclination of the heel bone relative to the declination of the metatarsals. In the Xray below we see the altered pitch in both the calcaneus and metatarsals. Not only does this alter the osseous or bone structure of the foot, but soft tissue compensations and contractures are going to follow. This increased metatarsal declination angle along with weakened foot intrinsics alters the muscle balance of the extensor digitorum longus (EDL) allowing hyperextenion and contracture of the digits. Furthermore the plantar flexed metatarsals lead to plantar fascia shortening which further locks the foot and impairs the foots ability to load and unload impact forces. The final characteristic of a cavus or high arched foot can be a plantar flexed first ray. The 1st ay includes the great toe, first metatarsal and medial cuneiform bone. If we load the foot in an open chain assessment we can see how a plantar flexed first ray would present. In the case of a plantar flexed first ray when the foot tries to establish a tripod, the plantar flexed 1st ray shifts the bodyweight onto the lateral aspect of the foot causing compensatory inversion of the heel or STJ. This STJ eversion and over-activation of the tibialis anterior further locks the foot and adducts the forefoot relative to the rear foot. One of the tests that can be done to see if the plantar flexed first ray is driving the STJ inversion is called a Coleman Block Test. In this test, the client / patients stands with just the first ray off of the block. 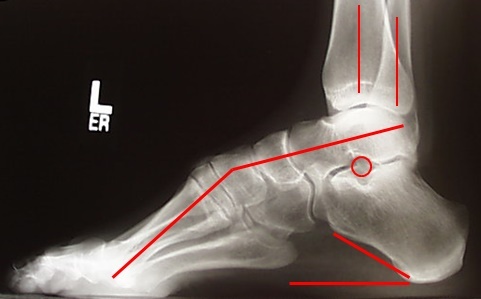 If the STJ neutralizes during this test then it is confirmed that – 1. the plantar flexed first ray is in fact driving the STJ inversion and 2. that it is a flexible and correctable deformity (often with orthotics). This test is covered in advanced EBFA workshops. So what do you do if you have a client or patient with this foot type? Understanding the unique imbalances presented in this foot type are important to correcting the efficiency of movement and restoring balance in the cavus foot type. Because the invertors play an important role in shock absorption, over-activity of these muscle make this foot type a poor shock absorber. Clients with this foot type may tell you they have a history of stress fractures or shin splints. Fitness Rx: To relax the over-activity of the inverters, integrate myofascial release into your client’s program. I like to address the posterior tibialis muscle by going to the bottom of the foot. Remember that the posterior tibialis has 9 attachments that fan the bottom of the foot. 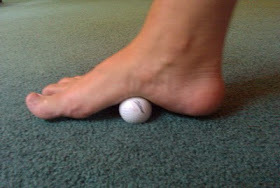 Standing on a golf ball is one of my favorite release techniques for the plantar foot. Reccommended 5 minutes every morning, evening and before working out. Normal walking and running require our foot to strike the ground in an inverted position. With the over-supinated heel already in an inverted position, the chances of twisting or rolling an ankle are even greater in this foot type. Typically the muscles on the outside of our ankle (peroneals) function to stabilize and prevent the ankle from rolling, however in the over-supinated foot type they are already eccentrically loaded and therefore cannot function properly to prevent ankle sprains. Fitness Rx: To relax the eccentrically active peroneals integrate myofascial release into your client’s programming. 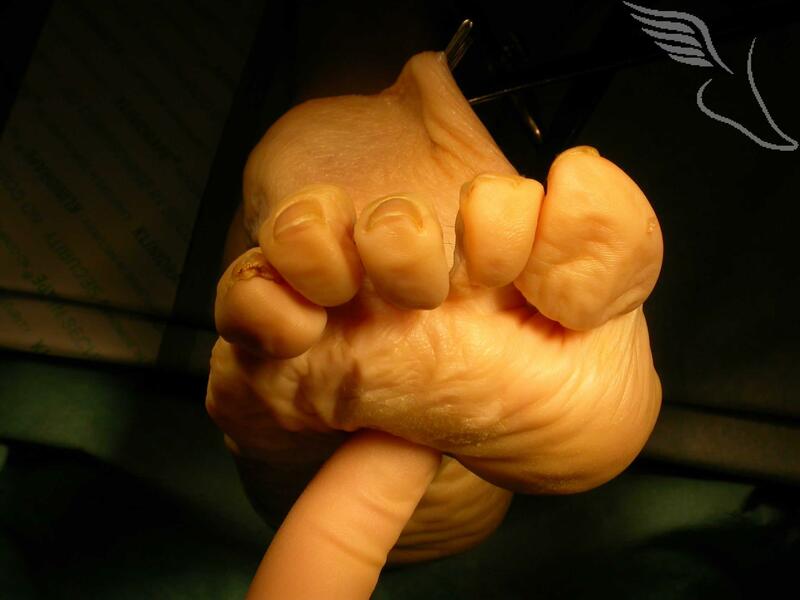 Because the peroneals are elongated in a cavus foot type you do not want to stretch an already elongated muscle. Stretching an elongated muscle can increase the tension placed on the tendon leading to further instability or tendonitis. Ensuring proper foot mobility also requires an assessment of lumbopelvic hip mobility. Through the lateral myofascial highway, the taut peronals in an over-supinated foot type will begin to pull on the iliotibial band. With its attachment to the tensor fascia lata on the anterior hip, an over-supinated foot type can cause secondary pelvic immobility. I often tell professionals in my workshops that the foot and hip are like a marriage. If someone has a locked foot and ankle you can usually assume their LPH complex will also be restricted. Fitness Rx: To increase LPH mobility in a cavus foot type, integrate TFL myofascial release into your client’s programming. I recommend following TFL, anterior hip release with dynamic stretches. This can be locked in with pelvic floor activation and deep hip stabilization. Movement efficiency is a common theme behind all the EBFA education and Certification Programs. By assessing and improving movement efficiency from the ground up we are better able to tap into the body’s natural loading and unloading mechanism. With each step we take 1 – 1.5 times our body weight in impact forces enters the body. Often associated with overuse injuries such as stress fractures or Achilles tendonitis, impact forces are actually a necessary component to efficient movement. The impact forces we encounter with each step are used by the body to run, climb, jump – or do a variety of closed chain movements we enjoy. Where injury and compensation ensues is when we begin to interfere with this natural relationship to impact forces. Inactivity, injury and surprisingly footwear all interfere with the loading of impact forces and the ability to move efficiently. When we first studying for our licensing or certification exams we learned that there were types of muscles contractions – eccentric, isometric and concentric. Often referred to as “negatives” or deceleration contractions, eccentrics are associated with hypertrophy training, plyometrics and rehab programming for tendon injuries. The above may be true for isolated movements such as a bicep curl or calf raise, however current research challenges the way we decelerate or load impact forces during sinusoidal, rhythmic movements – such as during walking. I first came across the concept of isometric contractions and the loading of impact forces when I was researching for a presentation on Achilles tendon injuries. Common among runners, Achilles tendonitis is one of the most frustrating overuse injuries. A 2002 study in the Journal of Physiology demonstrated that the gastrocnemius/soleus fibers actually contracted isometrically during the gait cycle – allowing the task of storing and releasing elastic energy to the Achilles tendon. Another 2012 study by Schleip et al. further supported this concept by stating that it was the fascia and tendons, not the muscles, which actually turned impact forces into elastic energy. This supports the concept that fascial work, more so than stretching, is more appropriate for improving adequate range. So why isometric contractions for the absorption of impact forces? We perceive impact forces as vibrations. I often tell my students to compare impact forces to the vibrations on a gong or two cymbals. To make the cymbals stop vibrating you put your hands against it. Similarly, the vibrations associated with impact forces need to be damped as they enter the body. The muscles in our feet and lower leg play an important role in deceleration by contracting isometrically to damp the vibrations. So are eccentrics completing out of the picture and a waste of time? Eccentrics are one of the best exercises for improving tissue elasticity and range of motion, however specific work should also be done to fascial tissue. According to Schleip et al. the best way to train fascia for energy transfer is through oscillatory, rhythmic movements such as those associated with Tai Chi, Gyrotonics or dance. Finding a soft elastic bounce at the end range of motion and activating the muscle in a lengthened position further bring elasticity and hydration to our fascial network. In lieu of this concept I now have many of my patients do Gyrotonics instead of yoga to specifically increase fascial elasticity and decrease their risk of overuse injury. To learn more about training fascia for movement efficiency – click here!